It all started with the man cave. You know, that den or garage area where your hubby goes to relax and unwind, surrounded by all of his manly things. 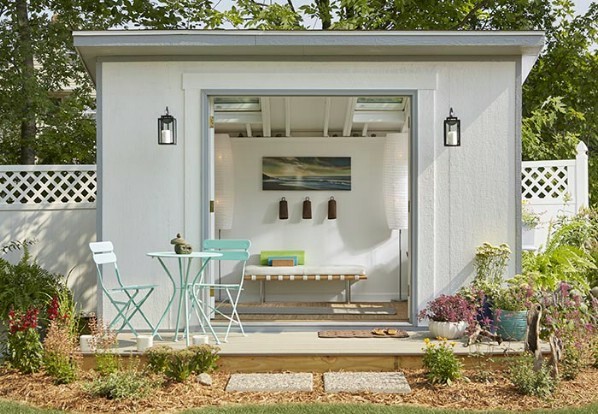 But what about when you want to relax surrounded by all your frilly feminine things—you know, the stuff your hubby doesn’t entirely “get?” Enter the hottest new suburban design concept—the she shed! 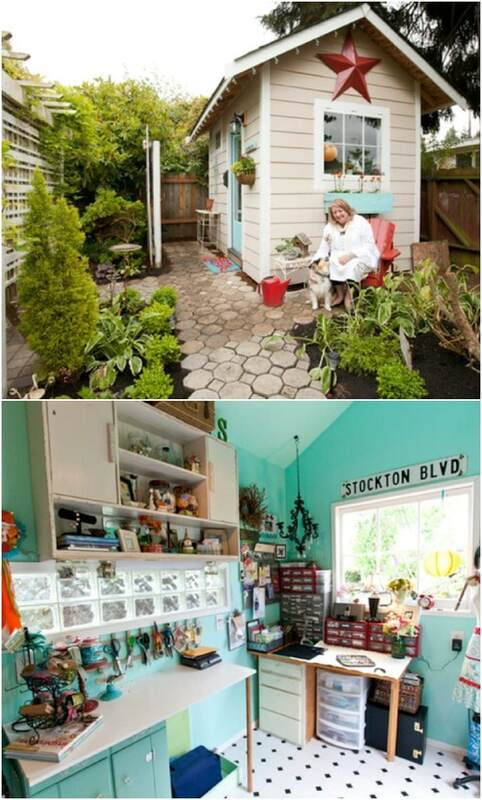 The “she shed” is the female equivalent of the man cave. Except that instead of being just a room in your house, it is a shed out in your backyard, separate from your main abode. There are a couple advantages to this. The first is that you get to enjoy peace, quiet and serenity (great if you have kids). The second is that you get the joy of designing your own private space, inside and out. 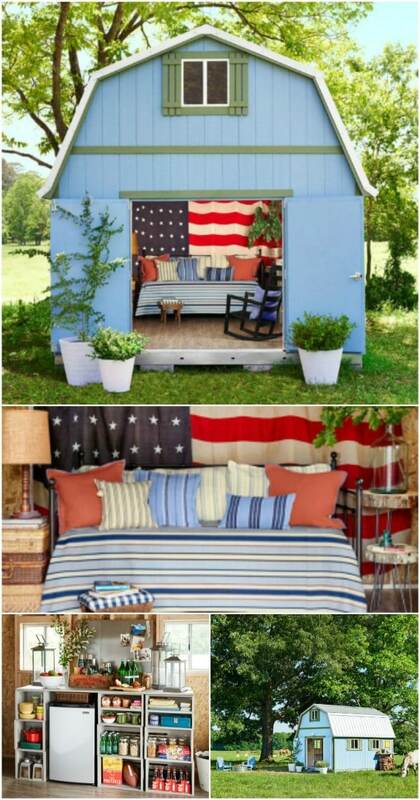 A she shed is the ultimate expression of your personality! 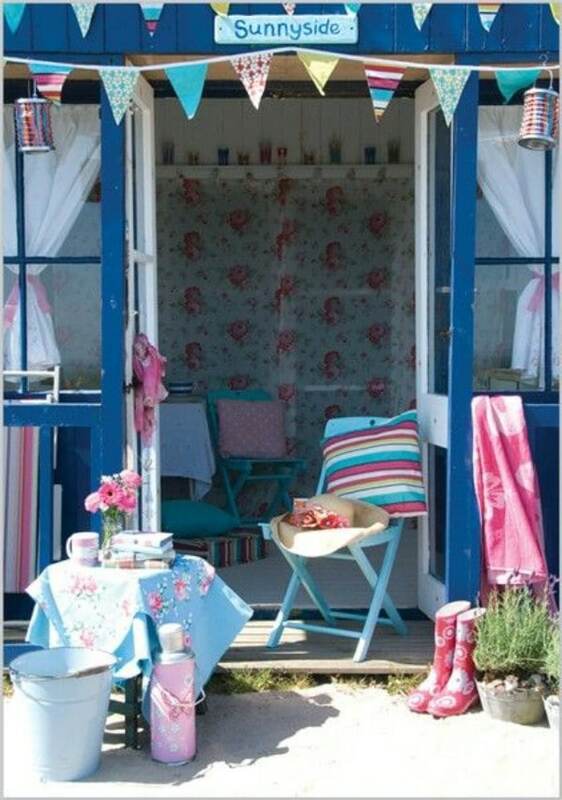 Indeed, many she sheds are so immaculately designed that they look like perfect little dwellings in their own right. In this sense, they are not so different from tiny houses. They are just tiny tiny houses. Usually they lack a kitchen and/or bathroom, but in some cases, they may include plumbing and other amenities. 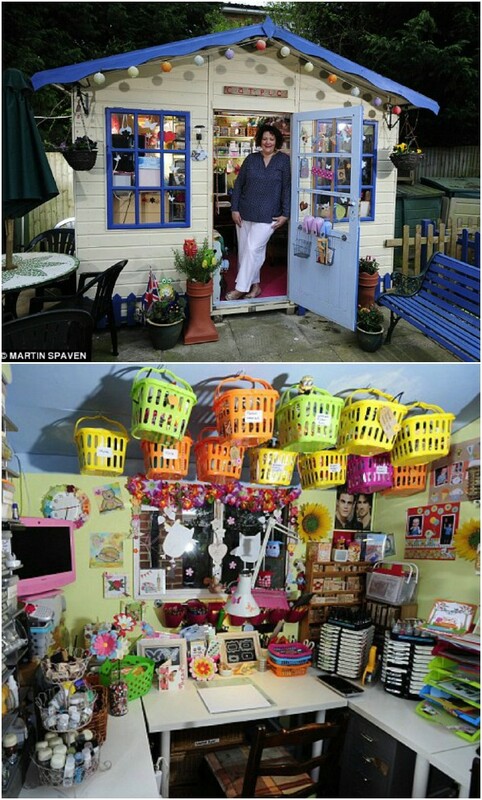 Let’s check out 80 of the most fabulous she sheds out there. 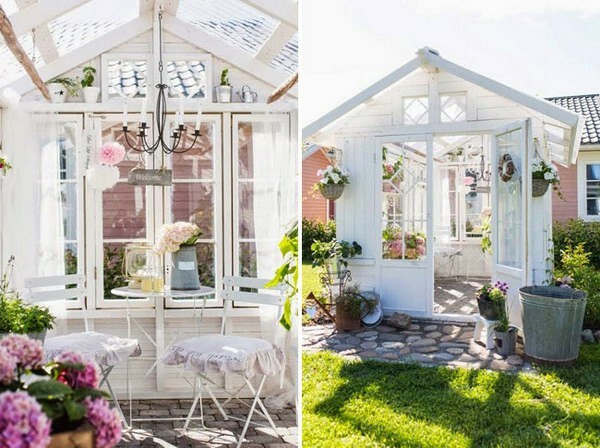 Once you’ve seen these beautiful feminine spaces, you will feel inspired to build your own backyard haven! Here is one of the most adorable she sheds ever! Originally this was just a standard backyard shed, nothing exciting, but now it is nothing but excitement! Just think how cozy this would on a snowy winter day! Kids would love it too—after playing out in the snow, they could come in and grab a hot cup of cocoa. Sticking with white as the principle color in design is very popular right now, especially among those who are looking for a soft, feminine look for their home environments. This she shed capitalizes on that idea, and includes some clever book storage as well. 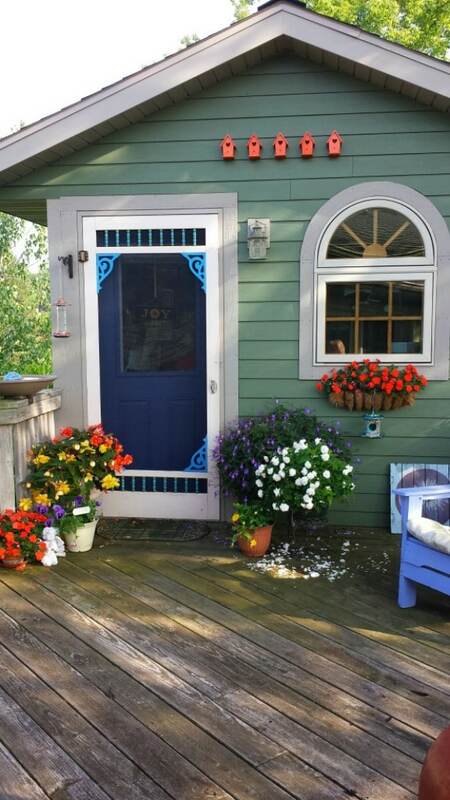 What I like about this she shed is that the shed itself hasn’t been heavily modified—the interior has simply been furnished and decorated with a few colorful embellishments thrown in to add some cheer to the doors. This would be an approachable project even for a beginner. It is a real shame there are no photographs of the interior of this she shed, because the exterior is exquisite! I love the cheery yellow and its summery contrast with the snowy winter setting. 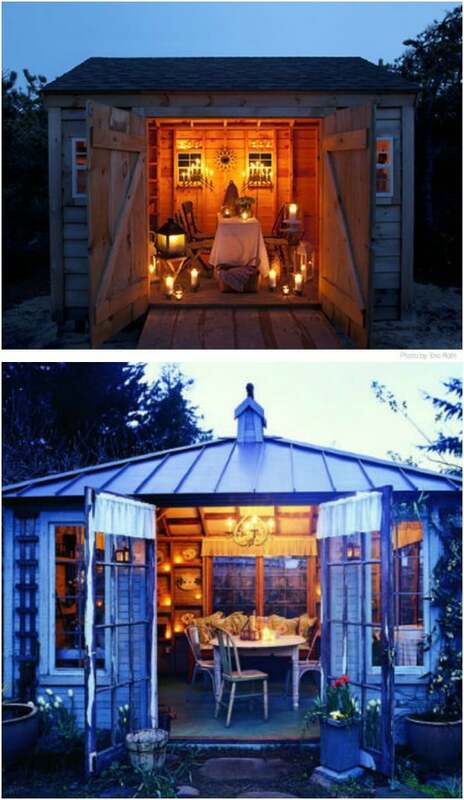 What’s not to love about this she shed? This is one of the best interiors I have seen. All those warm colors work together so beautifully to create a unique ambiance! This she shed also was designed around a specific purpose—reading—and that is another element which unites the whole. This little shed is just a delight to look at. Notice the big windows. 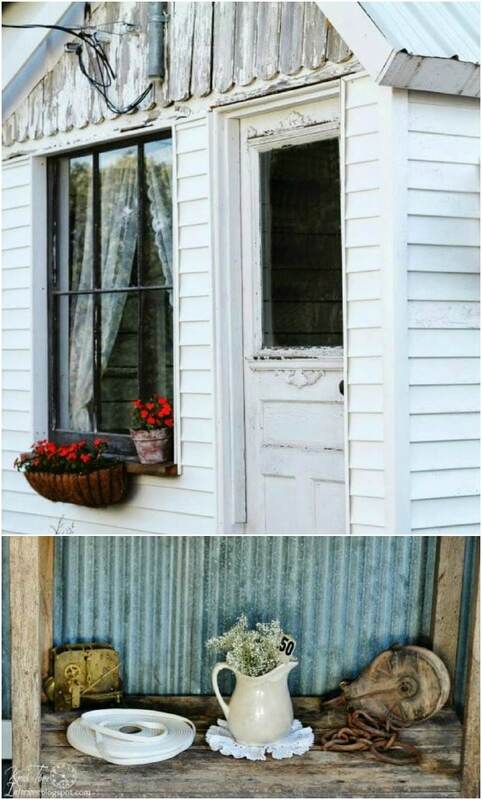 You can clearly see both the interior and exterior of this shed at the same time. It wasn’t designed with privacy in mind, but it does let in a ton of natural light, and allows its creator to continue to enjoy the beauty of her garden from inside. 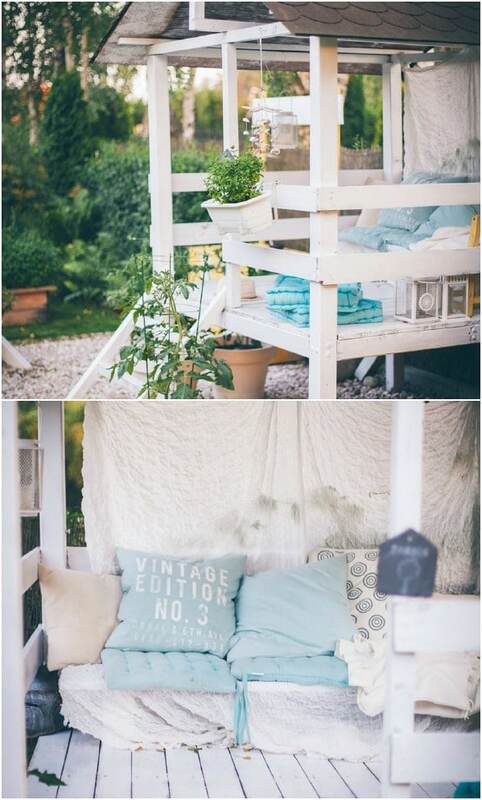 If you like the idea of creating a backyard reading nook, here is another she shed which has a very different look and feel than the one I shared before, but which I am certain would be just as cozy! 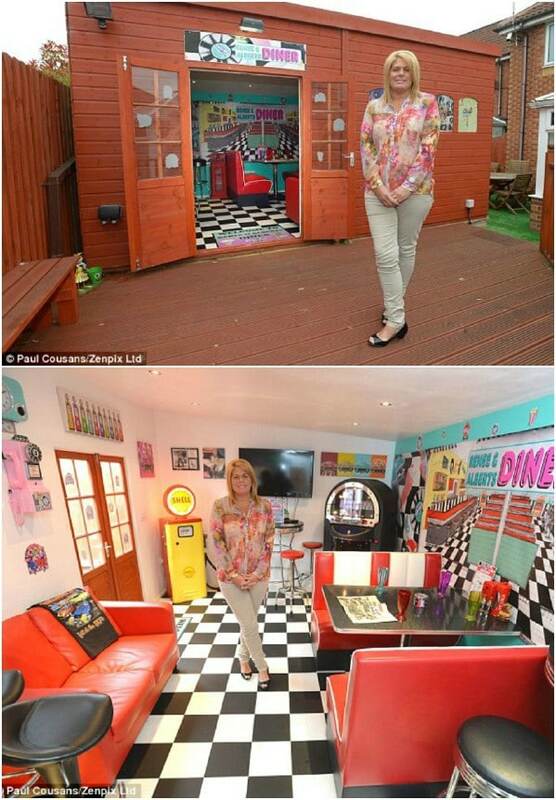 Wow, stepping inside this she shed is just like stepping into a second living room. Those look like some amazingly comfortable furnishings. The warm, bright colors create a cheery ambiance. This would be an amazing spot to lounge around with a good book! Spend much time looking around Finding Silver Pennies and you will notice quickly that Dani loves the ocean. 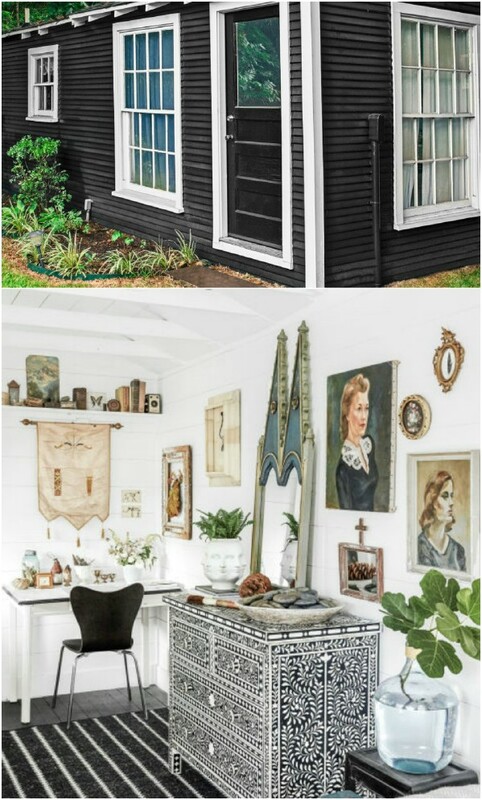 So when it came to creating a she shed, she brought the sea right into her backyard, making the perfect little cozy hideaway where she can relax among special objects and decor that remind her of the place she loves. This structure is a “Tuff Shed” (see the source link) which Country Living presented as an idea for a she shed. The big American flag and the bright blue exterior are very cheery and patriotic. Notice in the interior shot too how spacious this she shed is inside; it has a loft and everything! Here is an adorable little shed which has a pleasant rustic vibe thanks to the beautiful wood and the lovely trim on the doors and windows. The roof has a slight slant so that rain and snow are less likely to accumulate on top. The greenery adds a nice touch. These sheds designed by Modern Shed stand out in a couple respects. Firstly, they feature beautiful minimalist design elements with strong geometric features. Secondly, the hard contrast in the paint colors is incredibly vibrant. 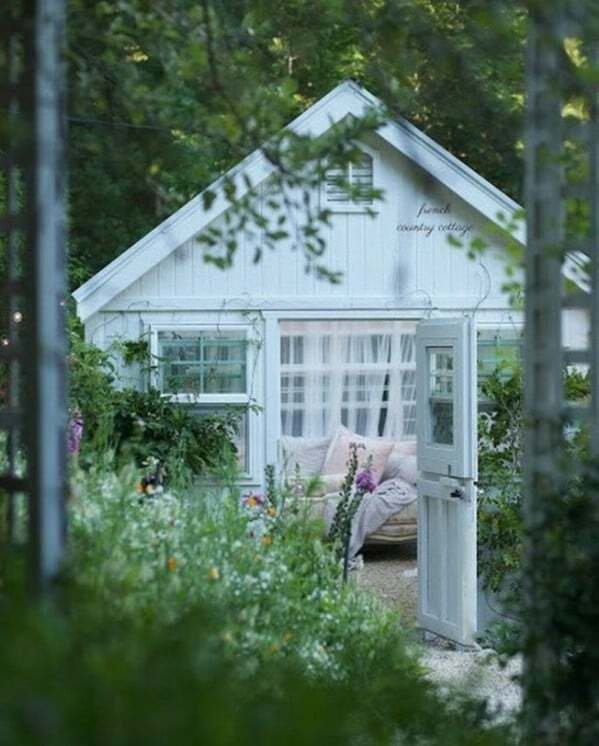 This shed has a look of dainty delicacy both inside and out, with lots of pinks and pastels and cute décor ideas. I especially love the oval-shaped window in the door. Somehow it gives it the feel of a dollhouse. This was actually designed as a playhouse for grandchildren, believe it or not. Those are some seriously lucky kids! Besides the cute playhouse-style design, what stands out to me about this shed is the mint green paint on the exterior and the rustic, simple warmth of the interior, which has that same mint green repeated in the furnishings. This may be a playhouse, but it’d serve equally well as a reading room, office, or craft room. This was a tool shed originally, before it was repurposed into a cozy craft cottage. A unified look was created through the liberal use of the color purple, applied to the ceiling, the cute sign on the wall, the counter and the bins. It is also repeated in the curtains and in the desk and chair. Created to serve as an artist’s studio, this little shed is wide open inside. The white paint on the walls and the wide skylights help to bring in the natural light and keep the space luminous. The blue striped carpet adds a splash of color. 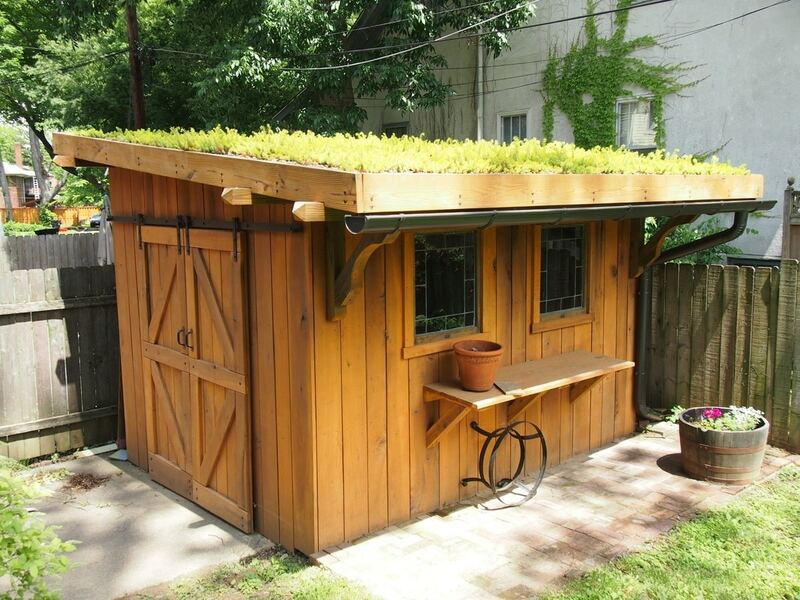 This shed serves as a potting shed for a gardening enthusiast. The exterior captures that reality as much as the interior, decorated with vines climbing a gorgeous rustic trellis. What I really like about this she shed is how it looks so much like a miniature suburban house, complete with the standard house shape and horizontal siding. It also reminds me a bit of a little chapel. Getting a sense of déjà vu? 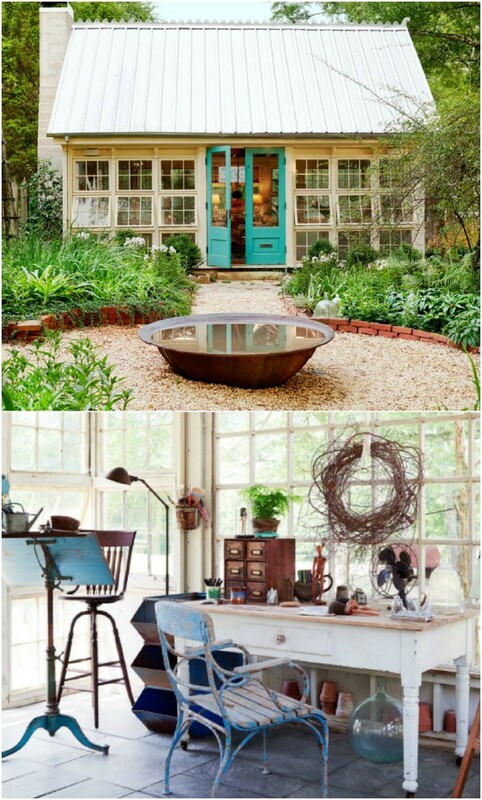 At first, I thought this was a different shed entirely than the contemporary one I shared earlier with the skylights that was being used as an artist’s studio, but it is actually the exact same shed (literally—notice the aqua table on the left in both). The interior has been redecorated here, which shows you how the shed could serve a different purpose—relaxation instead of work. 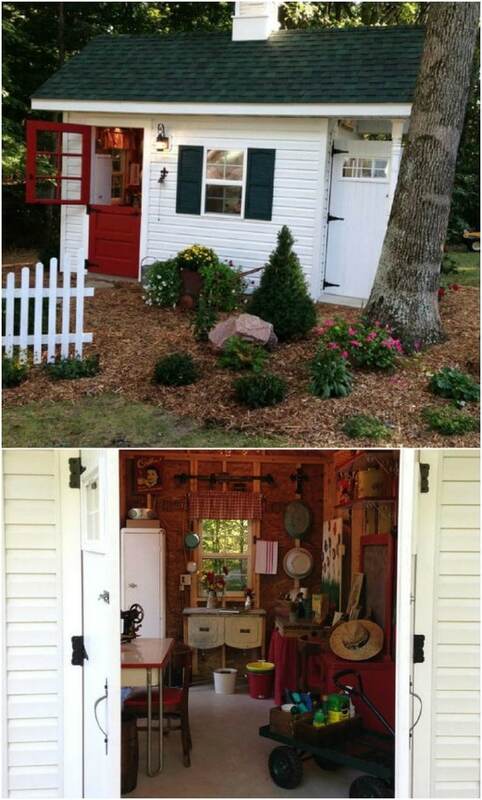 I really wish there were some interior shots of this adorable little shed! The teal blue forms a wonderful contrast with the bright white, and both stand out nicely against the backdrop of woods. The tiny windmill is also a very cute touch! This she shed is painted all in white with furniture painted likewise. The flowers add some color, and the white paint stands out against the bright green lawn. My eyes are drawn straight to the “23” prominently displayed on the side—very cute! 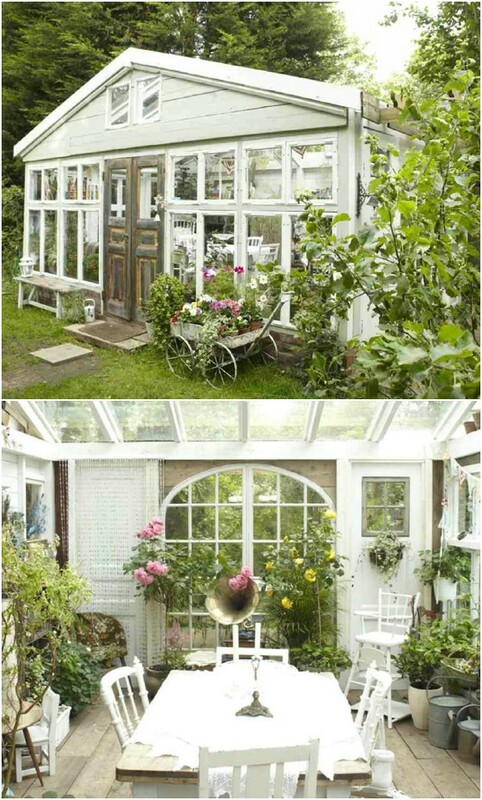 Looking at this glamorous she shed/greenhouse with its dazzling chandeliers, it is hard to believe it started out as a plain old garden shed. It was a wedding gift from a husband to a very lucky wife—hang onto that one, hon’! Before, I shared a shed which had a lot of purple worked into its design—now here is one which has a lot of pink! 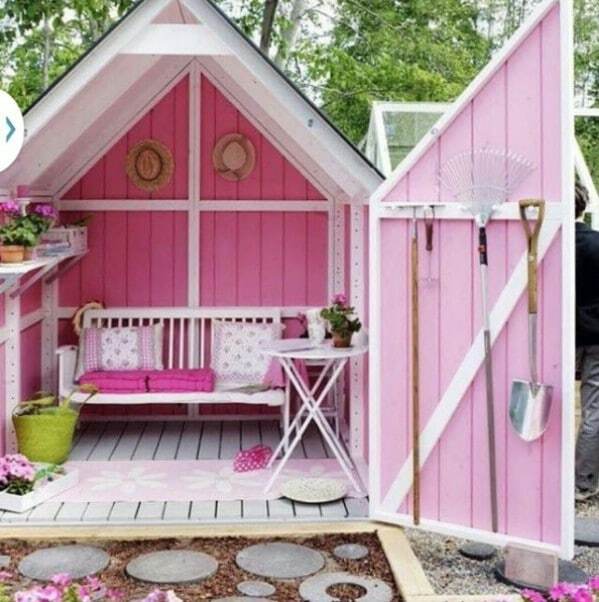 In fact, pink is the main color for this shed, with the white trim adding some contrast. 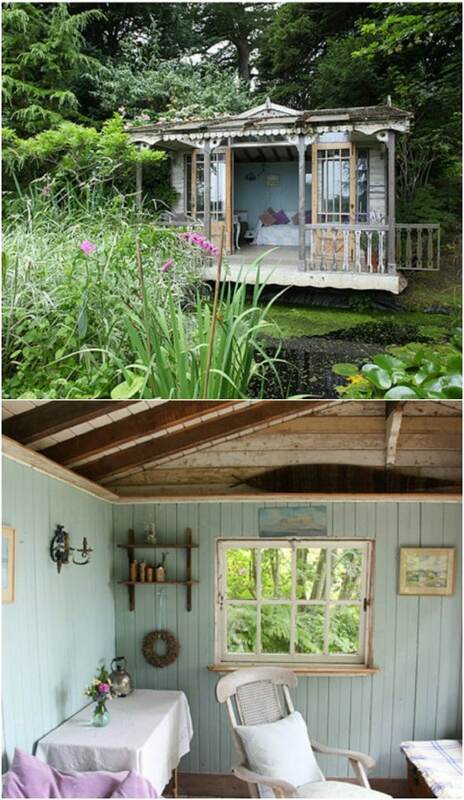 It is very much still a functional garden shed, but also looks like a nice spot to relax. 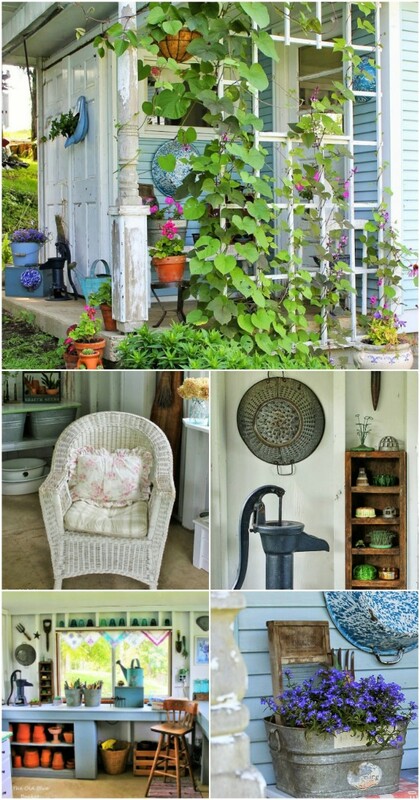 Between the lace curtains and what looks like a gingham pattern of some sort on the little couch in the back, there is plenty of old-fashioned charm to lend this quaint little she shed a timeless appeal. 26. Cover your shed completely in plants. Okay, so it’s not completely covered—you can still access the door. But all that greenery draping over the top makes it look like you are stepping inside some kind of fairytale forest cottage. 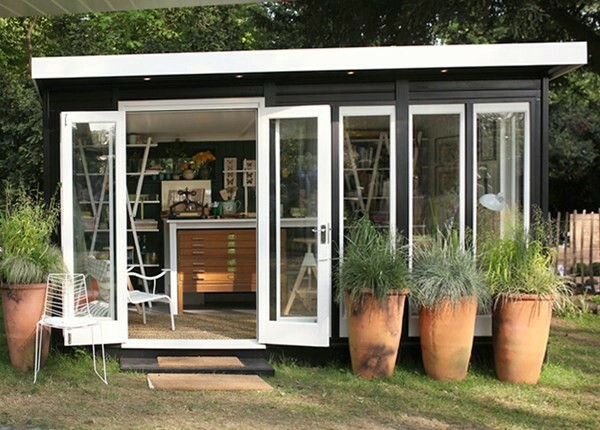 This shed was from the 2012 RHS Chelsea Garden Show’s “Artisan Retreats” exhibit. The doors and all of the windows can be opened wide to let in fresh air and light. 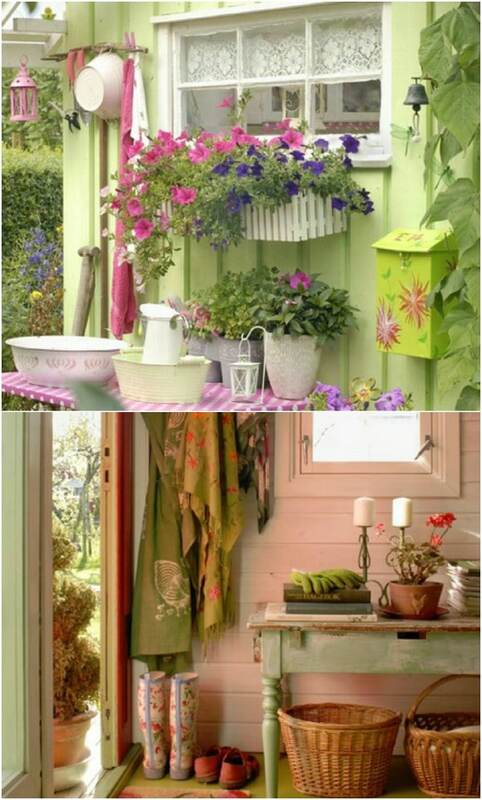 The green color is unusual, which lends this shed some quirky eclectic appeal. 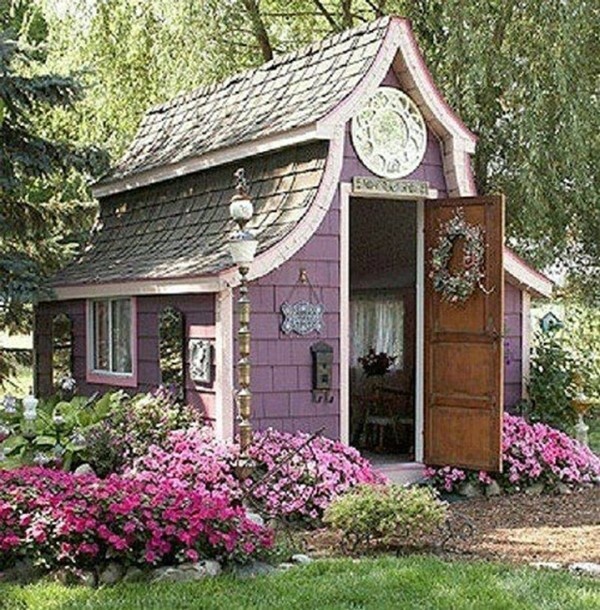 With its little cobbled path, the surrounding forest, the picket fence, and the lovely flowers, this shed looks like a cottage that’d belong to a fairy or a good witch in a children’s story, doesn’t it? What a lovely garden! 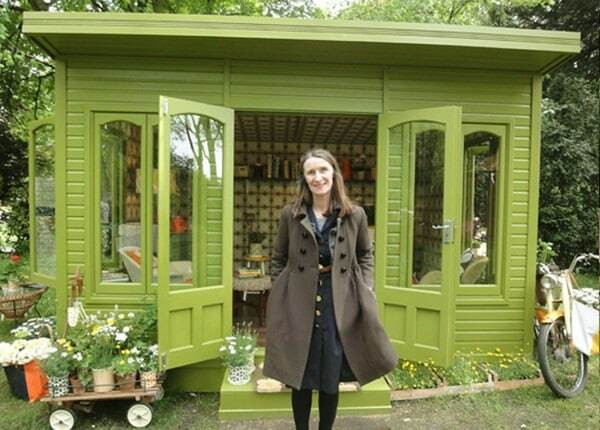 Also featured at the 2012 RHS Chelsea Garden Show’s “Artisan Retreats” exhibit was this bookbinder’s workshop. The design is minimalist, with an entire wall serving as doors and windows. 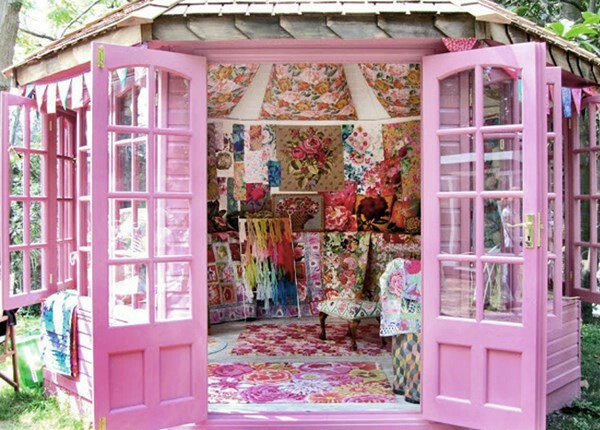 This frilly pink “she shed” actually belongs to a man, artist Kaffe Fassett, who is a textile artist. The walls and ceiling are beautifully embellished with his work, and the unique shape of the structure lets in light and offers a beautiful view of the outdoors. 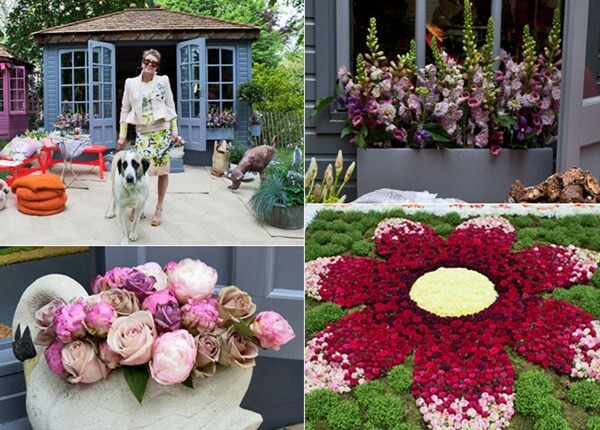 This she shed belongs to floral designer Nikki Tibbles of Wild at Heart, and does a wonderful job expressing both her personality and her talents. The bright orange doors of this she shed instantly convey a sense of homey comfort and delight. They also echo the bright, cheery hues inside. The elegant light fixture adds a sophisticated touch to the interior. 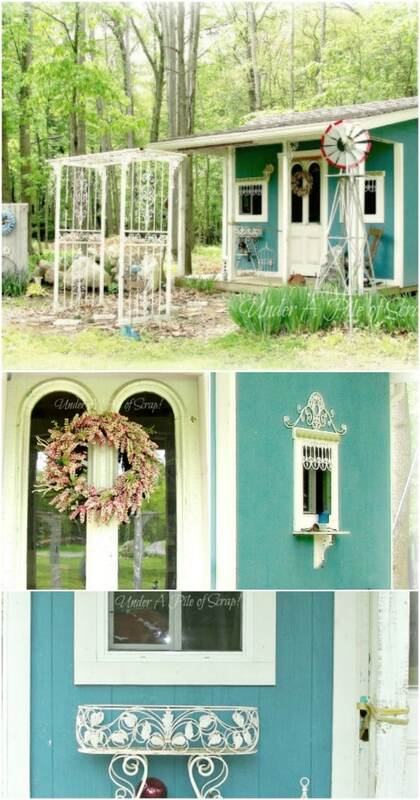 This she shed looks like something out of the pages of a fairytale. The mauve color used to paint the exterior is beautiful—it is at once striking enough to grab attention and muted enough to fit in beautifully with the surroundings. It also works well with the colorful flowers. 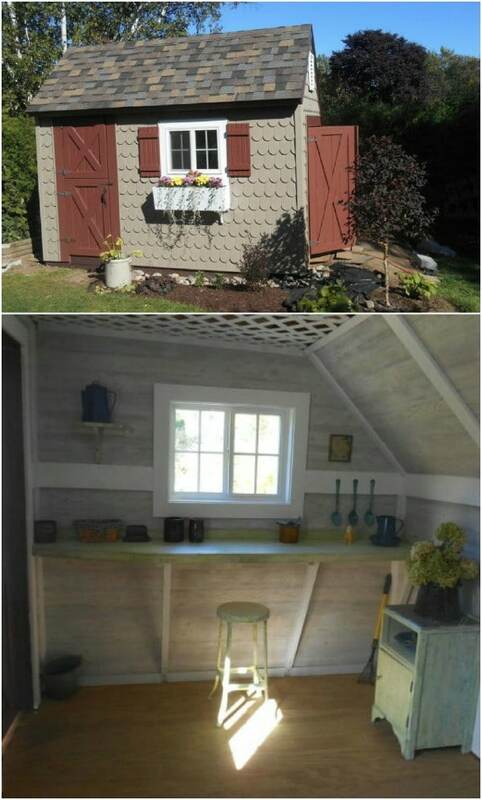 This she shed looks like a tiny dollhouse you would play with in childhood—only it has been blown up to full size so you can actually step inside. 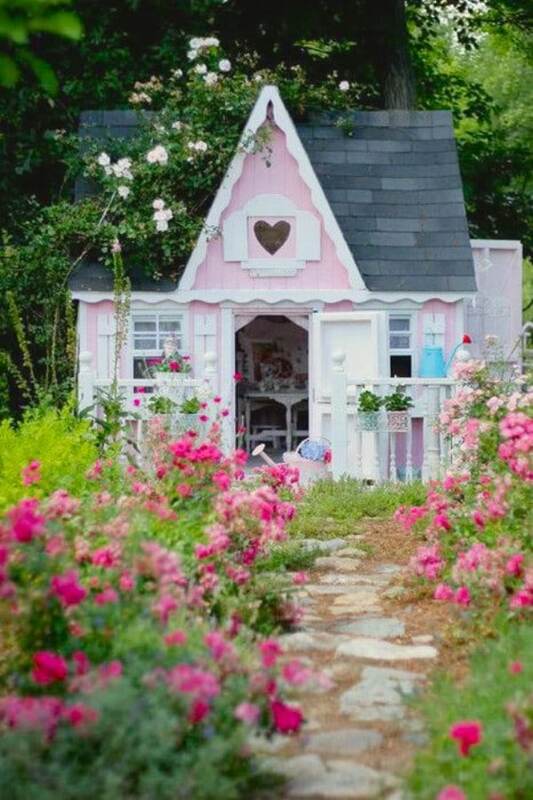 The garden is gorgeous, and the pale pink siding and cute little heart-shaped window really make this she shed look like a delightful backyard escape! Everything about “Sunnyside” shouts “summer,” from the cute triangular flags to the bold blue and pink hues to the lovely décor, and of course the name of the shed. This would be a wonderful place to relax during the hot summer months—or to immerse yourself in a summery atmosphere during any time of the year. Here is a she shed which instantly stands out because of its unusual and bold color choices—the deep purple hue of the doors and the trim around the windows stands out against the muted dark greenish grey (or is it brown?) used for the siding. The interior also has a somewhat somber vibe from what I can see—but it looks like a wonderfully cozy retreat. Here is a shed which does not pretend to be anything other than what it is—it is clearly a shed. But the unique shape of the door as well as the elegant décor and soft ambient lighting really has a gorgeous effect. This is an image which has made rounds online, but no one seems to know for sure where it came from. Wherever it is, the owners of this backyard shed are amazingly lucky—it looks like a rustic dream come true! 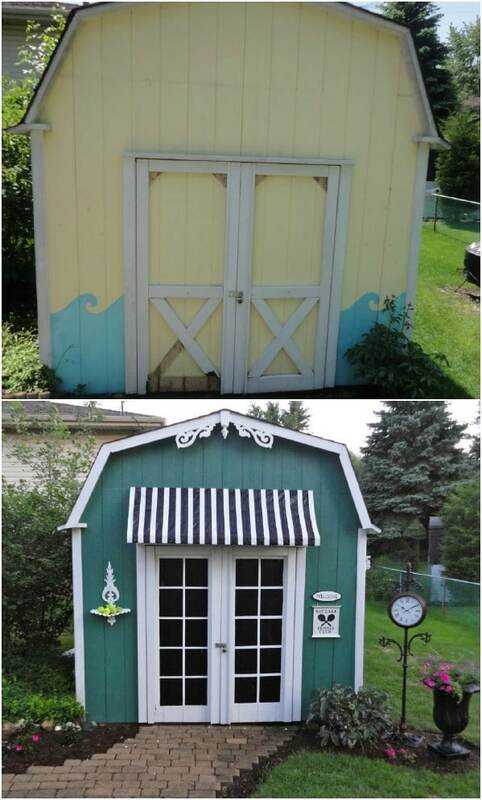 This shed shows how you can use bright, fun colors to accent an otherwise dull exterior. 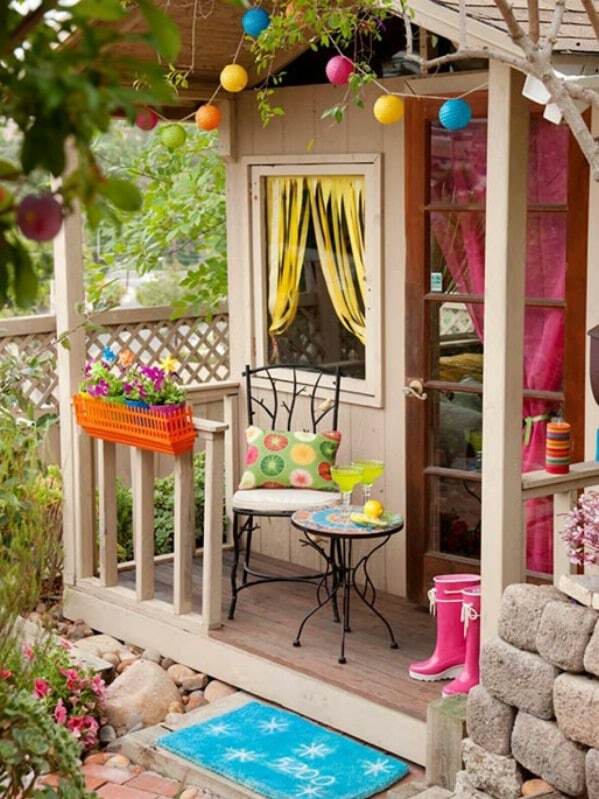 The shed itself is a standard tan color, but your eyes are instantly drawn to the yellow and pink curtains, the orange planter, the colorful pillow and lanterns, and even the bright hue of the drinks on the table. 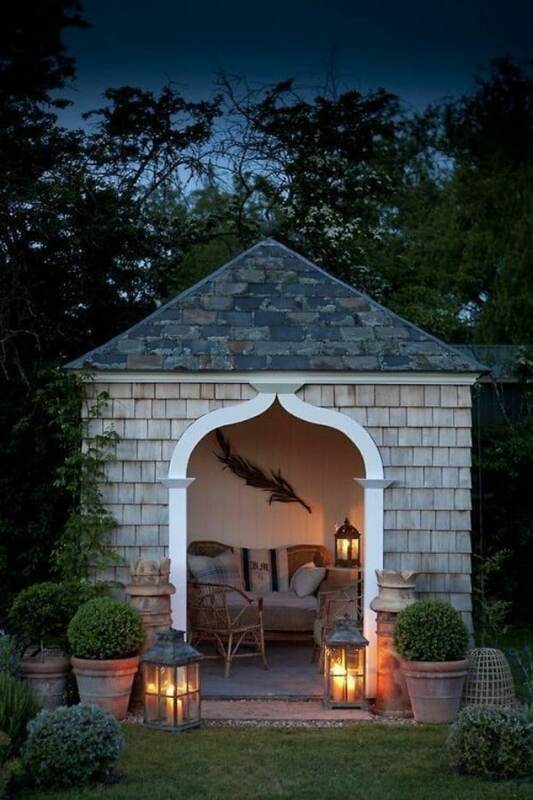 This isn’t technically a she shed, but it provides you with another possibility to consider when it comes to creating your own backyard haven. 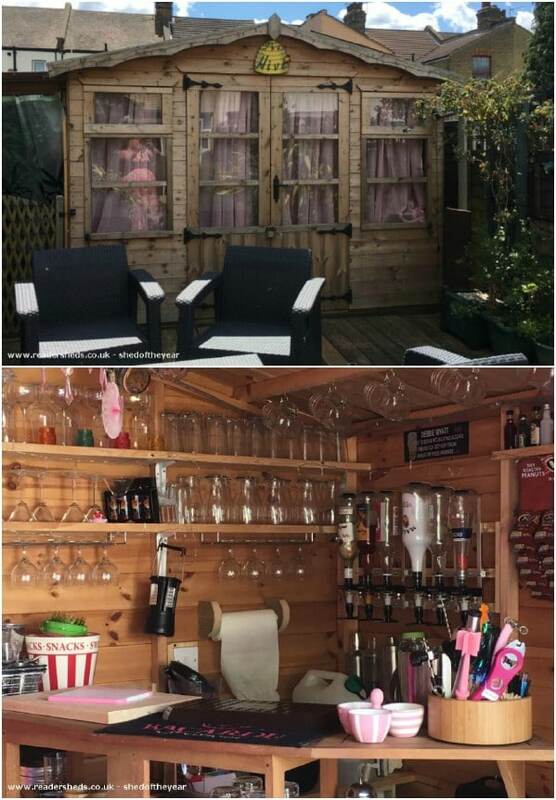 Don’t have a shed out back to convert, but do have a cabana? With the right furniture, you can easily turn it into a comfy spot to relax—and don’t you just love that beer bottle chandelier? Almost all the materials used to create this amazing potting shed were found cheap at flea markets, making this an economical project with astonishing results. 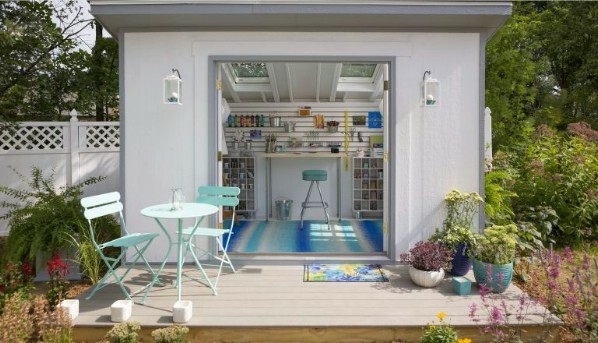 The walls of this little she shed are almost entirely made out of glass, making this a stunning retreat for those who enjoy a spacious, open feeling and plenty of sunlight. This design would act as a greenhouse, staying warm in the winter and helping the flowers to grow. It positively soaks up the sunlight—it’s just a warm bath. Of all the she sheds on this list, this one may be one of the most fantastic. Located on the Isle of Wight, it has its own little garden pool with lily pads and offers a view of the sea. 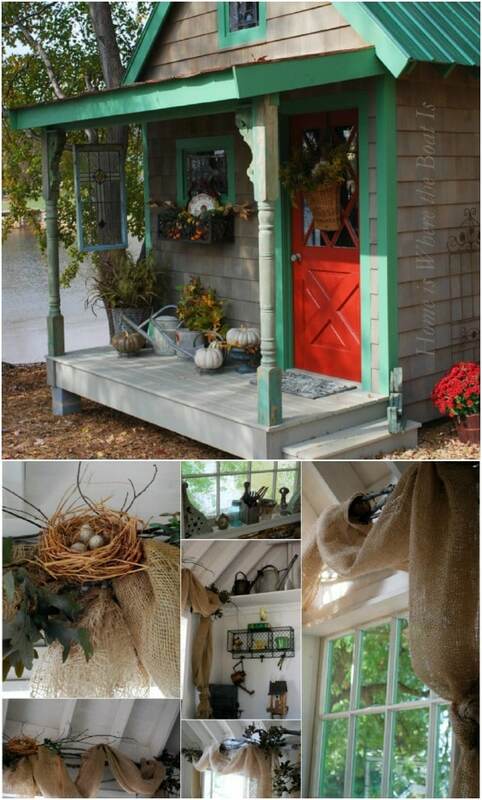 Rustic elements are incorporated in every detail of the interior and exterior, making for an atmospheric design. 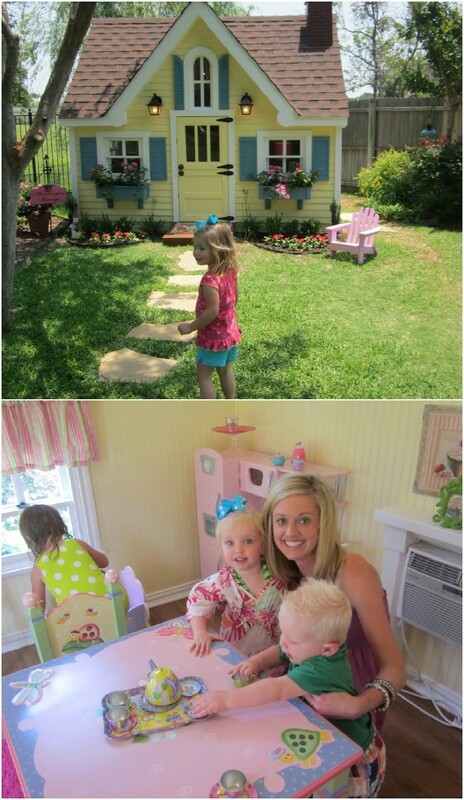 This one is a playhouse for children, but it still offers some inspiration for she sheds. 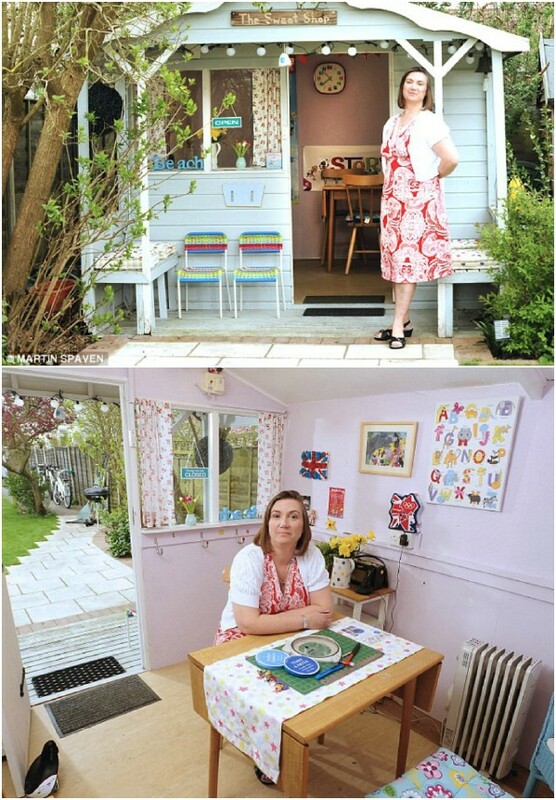 After all, what is a she shed really, other than a playhouse for grownups? 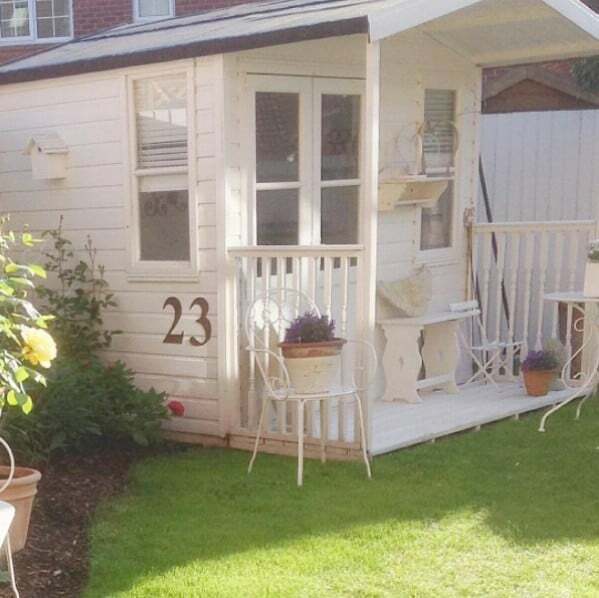 This lovely little she shed was designed and decorated by Toni of the blog Design Dazzle for Wright’s Shed Company. The entire shed was done in shades of creams, pinks, whites and tans. It has a rustic look and feel, and is absolutely beautiful inside and out. The bold, deep red color of this shed is surprising and unique, contrasting with the white trim and the pale yellow used for the shutters. As you can see, the interior is surprisingly spacious, offering plenty of room to relax and work in comfort. 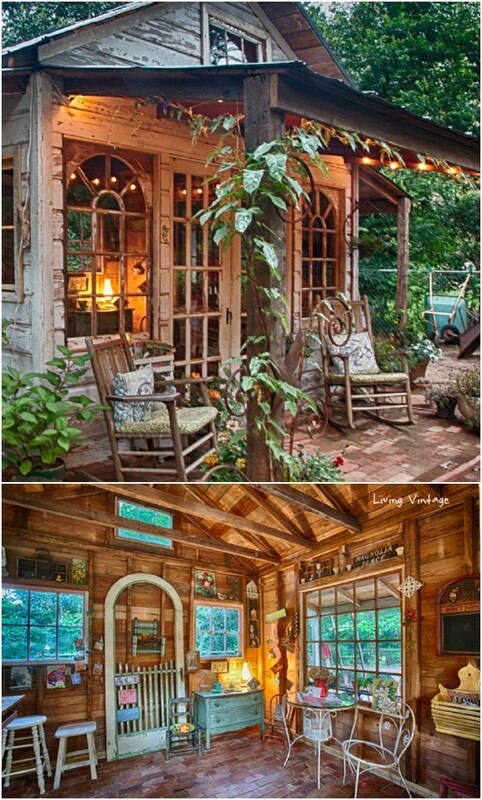 With all that rustic wood and those big windows, this garden shed looks like an absolute dream! Imagine being able to relax on that porch. The soft lighting both inside the shed and outside makes the entire structure simply glow with a magical light all its own. 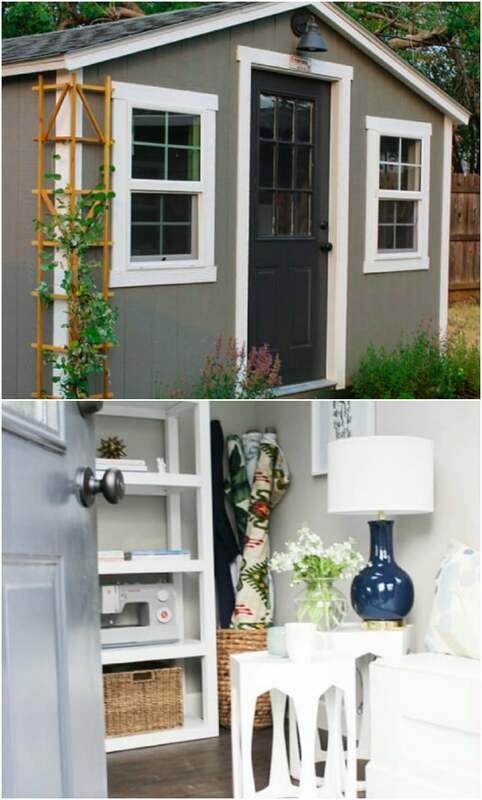 You may think that you do not have enough money to create a she shed, but if you already have a shed in your backyard and a little creativity, you would be surprised at what you can accomplish with fairly scant funds. It is hard to believe this amazing makeover only cost $40! 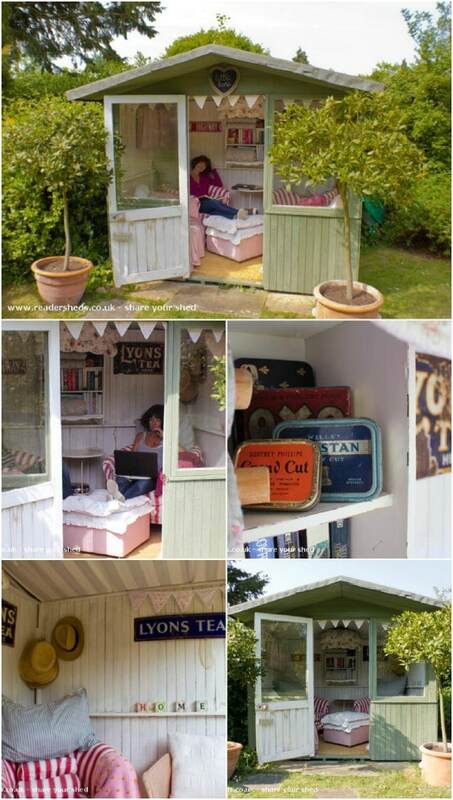 British she sheds have a particular charm about them which is distinctly recognizable. This little cottage outside of London is exquisite to behold. Be sure to check the source link for the rest of the images, as you will not want to leave a single inch of it unexplored. 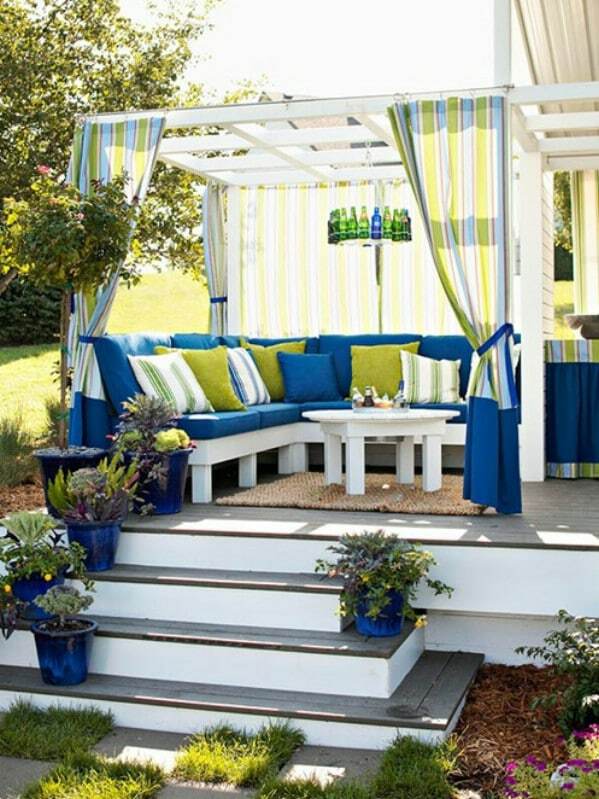 It is hard to say what stands out more about this setup—the beautiful greenhouse-style she shed itself, or the lovely grounds around it, complete with a beautiful trellis, a table and chairs under the shade of an umbrella, a functional fountain, and amazing landscaping. Perhaps it is the whole and not just the sum of the parts that captures the imagination! Here is something you don’t see everyday—a mom blogger who documents life with her teenage daughter (why don’t we see this more often, ladies?). 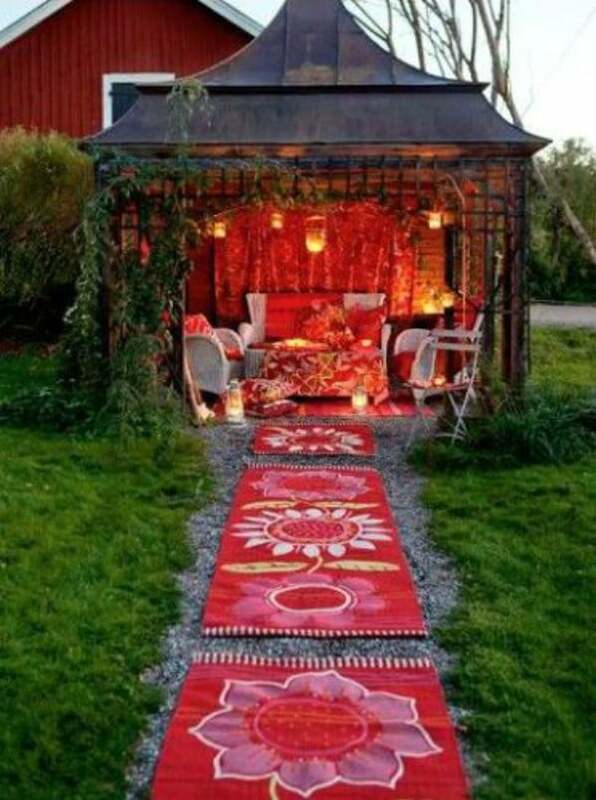 Here is a lovely shed she built for her daughter so she would have her own special place to relax and hang out with her friends. There is nothing overly fancy about this shed, but it still is lovely to look at inside and out, and makes for a charming little studio. 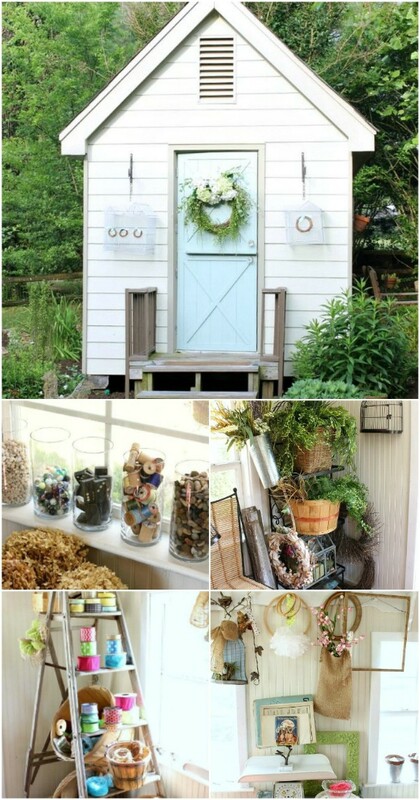 This is a jeweler’s backyard studio, a peaceful little haven where she can focus on her craft. What stands out the most is of course the bright turquoise hue of the interior walls. This bright color gives the entire place a cheery, summery, refreshing atmosphere. Turquoise is apparently a very “in” color, as this is about the third or fourth turquoise she shed featured in this list. 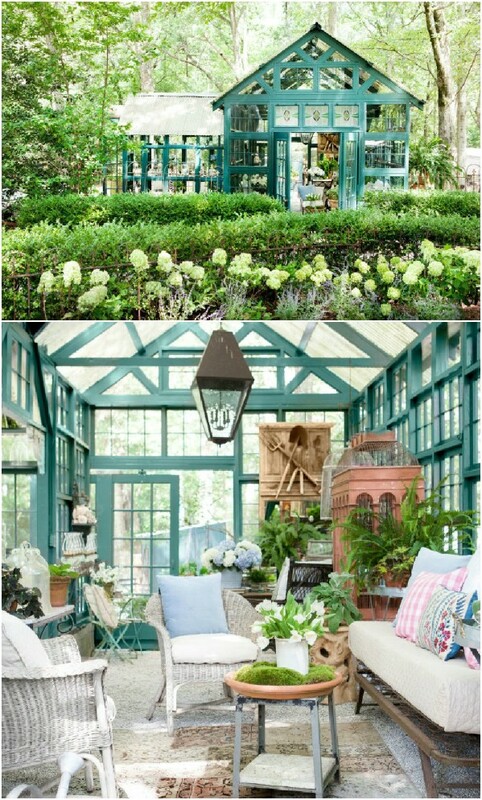 I love how the color stands out between all the glass panels comprising the walls of this greenhouse. It looks marvelous inside and out. 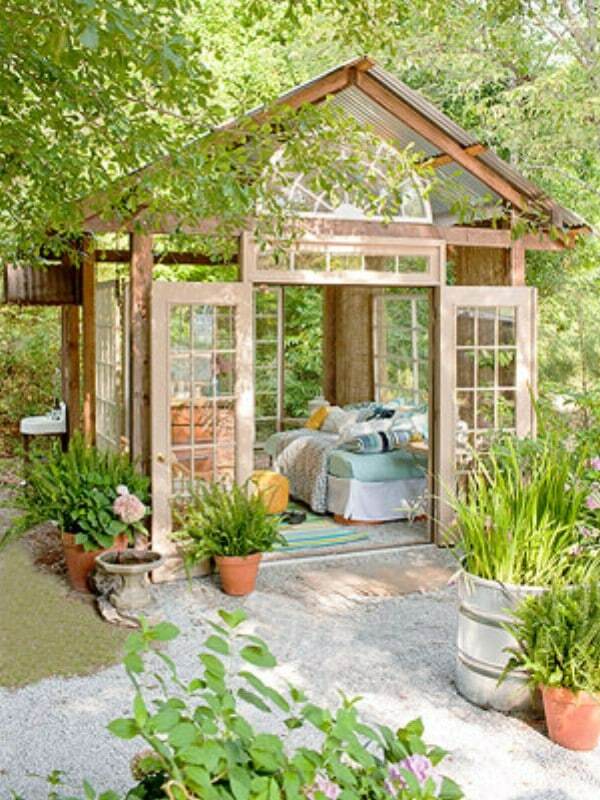 Here is a lovely, airy greenhouse-style backyard retreat which looks like an amazing place to relax and spend an afternoon in solitude. What is particularly awesome about this one is that there are free plans available! Just click on the link below. You do need to subscribe at BHG to download the plans. This cottage in Surrey belongs to Caroline Counsell, who lives with her husband and two sons, and sometimes needs to get away and spend a little time with herself working on her craft projects. The studio looks to be a bit cluttered, but in a very pleasant, homey way. 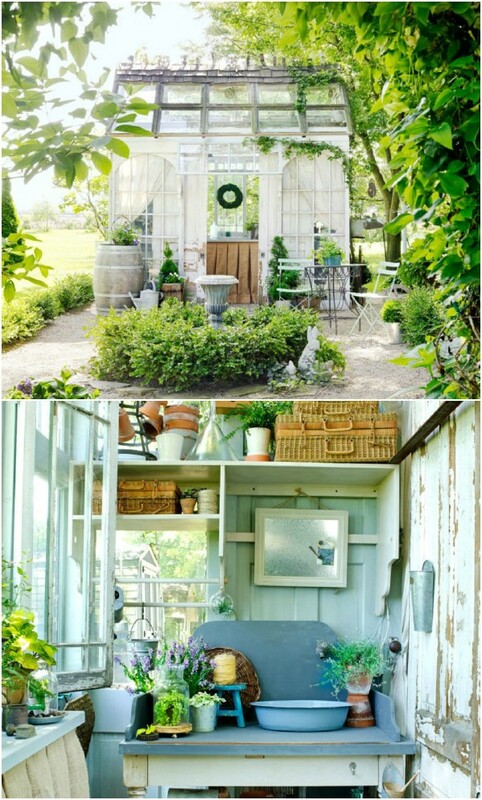 This potting shed has a simple design, but something about it seems very fairytale-like to me. Maybe it is the bright red door and the contrast of the green trim and roof with the rustic wood siding. With its bright red door trim and its contemporary design, this potter’s shed looks like the ultimate tranquil workplace. The before and after shots here demonstrate an incredible transformation. 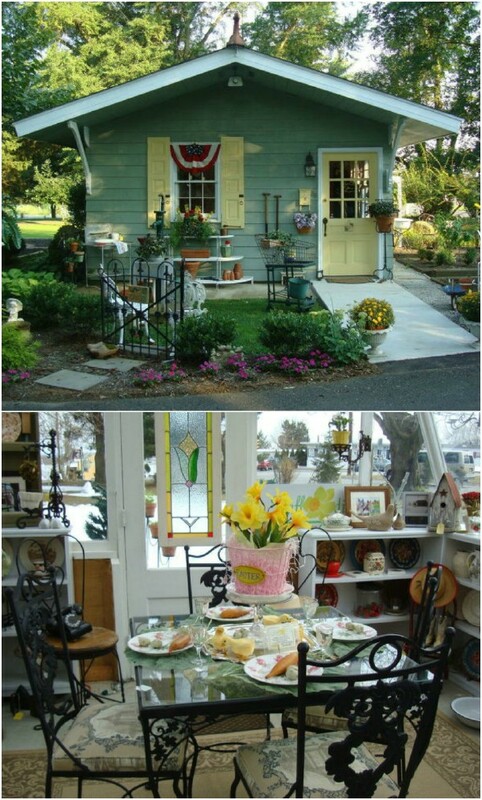 Once a shabby old shed, this little structure is now an adorable antique shop! 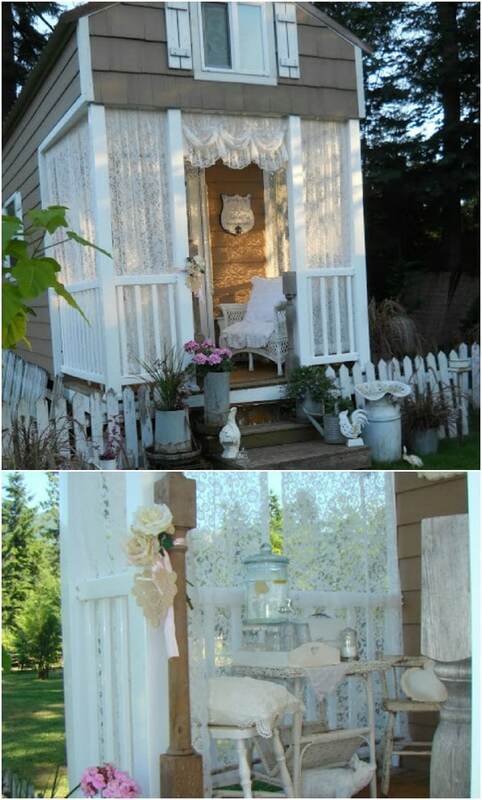 Here is a she shed which has practically become a legend online; I run into images of this shed everywhere. The sad part is that nobody seems to know who made this beautifully-lit and decorated shed. In any case, it’s amazing! Preferring to refer to her she shed as her “Zen writing cottage,” Barbara Techel says that the cottage actually improved her marriage. Barbara got married right away after she graduated from technical school and never got to enjoy the feeling of independence that came from living on her own, so having this special space just for herself helps her to experience some of that independence. 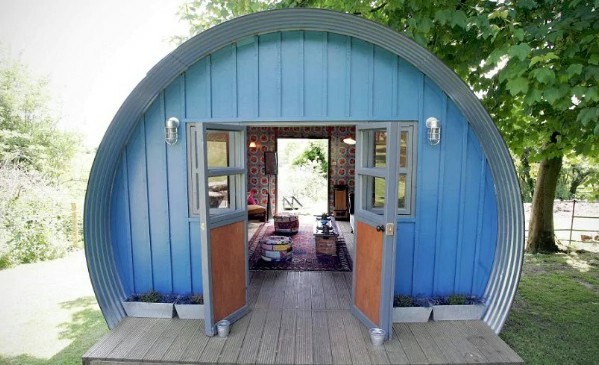 This may be one of the most amazing backyard sheds yet. 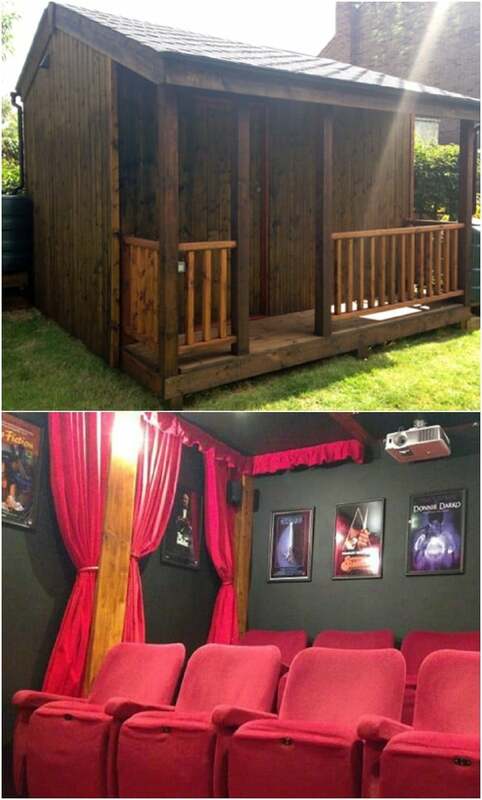 It looks like nothing much on the outside, just a standard tool shed, but inside, you’ve got tiers of cozy red seats, movie posters, snacks, red curtains and a big screen. It doesn’t get more awesome than this. Manjit Sidhu is a police officer who likes to sew to relax. Her she shed is absolutely adorable, and makes for the perfect spot to work on her masterpieces and chill after a long day’s work on the force. 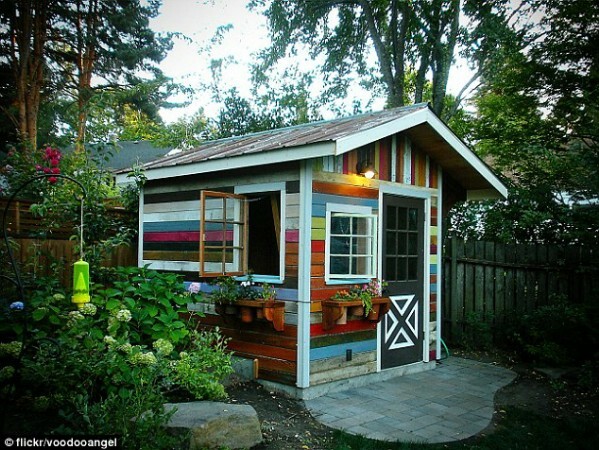 Could this be the most colorful she shed ever designed? It just might be, with each part of the siding painted in a different rainbow hue. Both the interior and exterior of this she shed are decorated in green and pink, making for an absolutely delightful look! 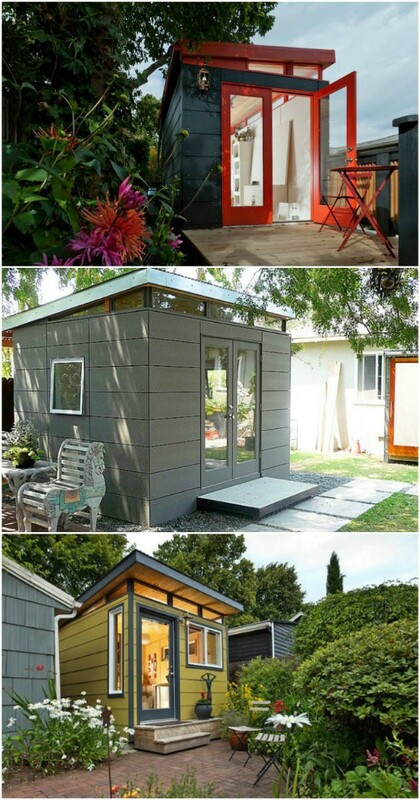 Constructed as a guesthouse, this amazing tiny house was built out of two renovated sheds. In total, the finished structure measures just 250 square feet and contains two bedrooms. 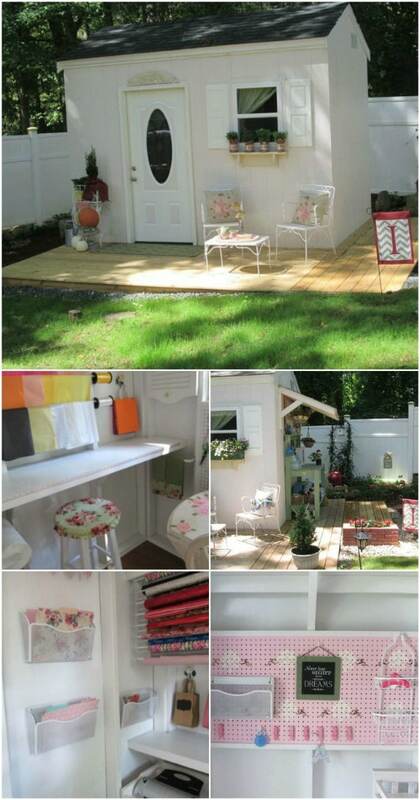 Earlier, I shared a converted cabana to show you how a “she shed” doesn’t necessarily have to be an actual shed. 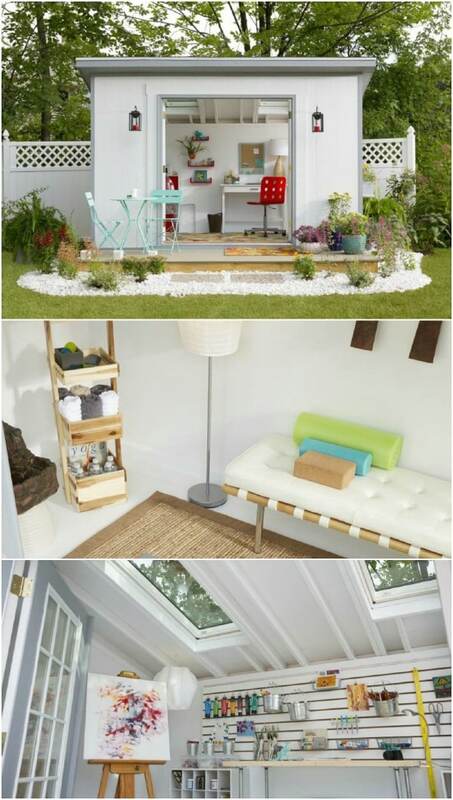 Here is another take on the she shed concept, this time with a converted porch. As you can see, just adding some lace curtains around the sides managed to transform this porch into a magical sanctuary! 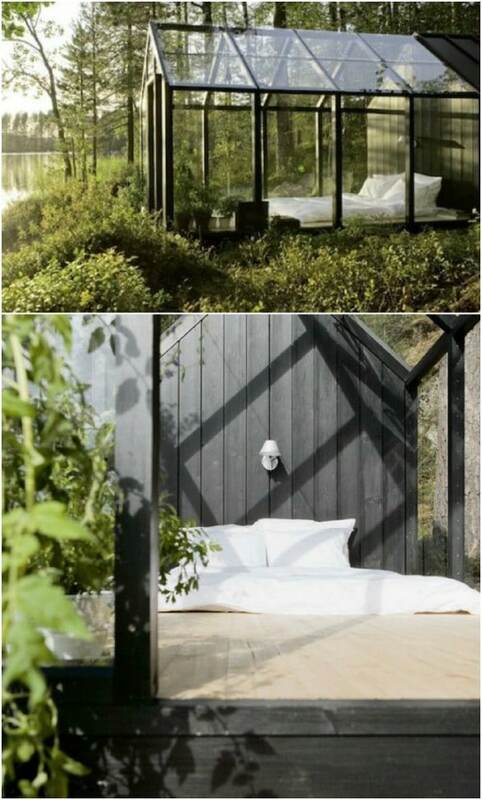 Now and again you see a she shed image online which seems like it must be computer generated or something, because it is just so beautiful and perfect … and that was what I first thought when I saw this serene glass cabin. But it is definitely for real. In fact, you can buy your own prefab garden shed kit to build one for yourself through Kekkilä Garden in Finland or Hasselfors Garden elsewhere in Scandinavia. 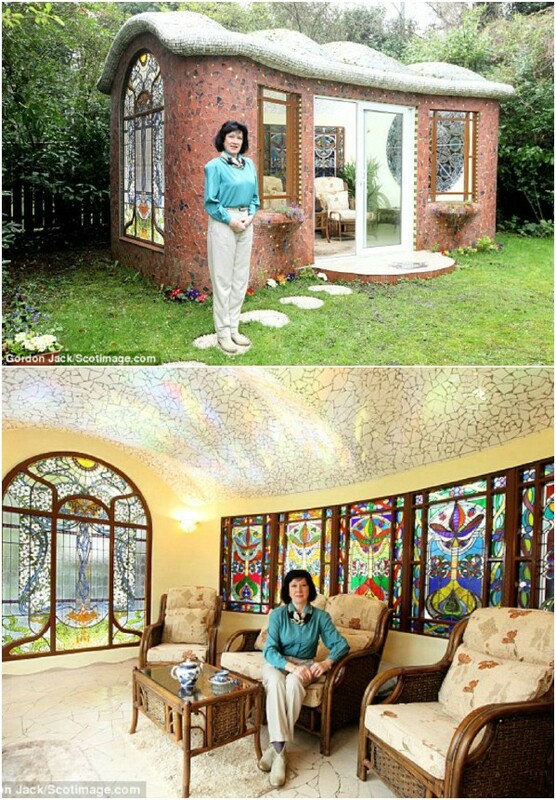 Here is a famous she shed which was named “shed of the year” in a design contest, and which features a unique shape. 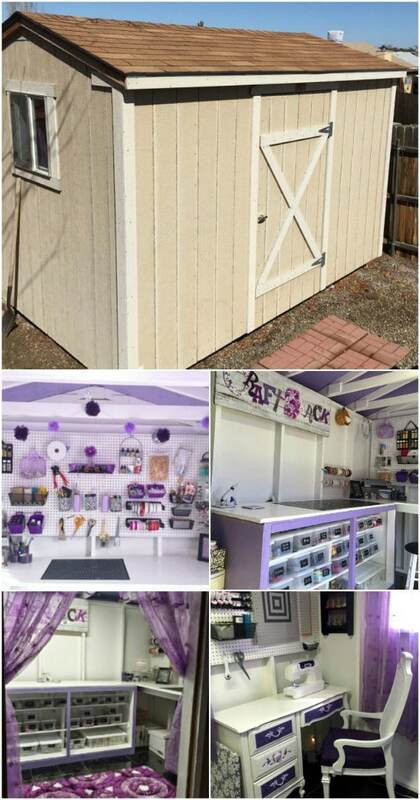 This woman’s husband and son built this entire shed from the ground up for her! She took care of the landscaping. That’s one lucky lady with an amazing family! This guest room was constructed in an old garden shed, and it just looks like the most stupendously comfortable place to stay! I highly recommend checking out all the other photos and the story of its renovation at the source link. 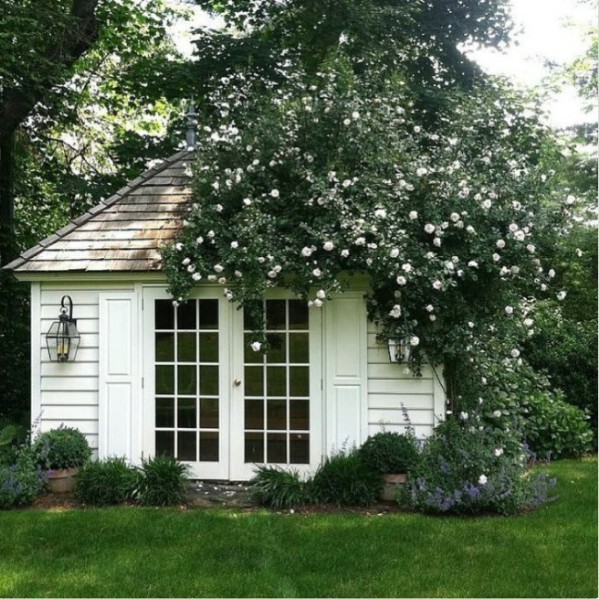 If this garden shed looks a bit like a nostalgic, old-style schoolhouse, that is not a coincidence—it was designed by a second grade teacher to be her ultimate dream shed. It is so cute! Most of us don’t manage to build the dream home we envisioned when we were 15 years old, but Sandra Foster did it, complete in every exquisite detail. Sandra’s story is actually pretty amazing, and well worth checking out. Click on the source link to read it in the New York Times. 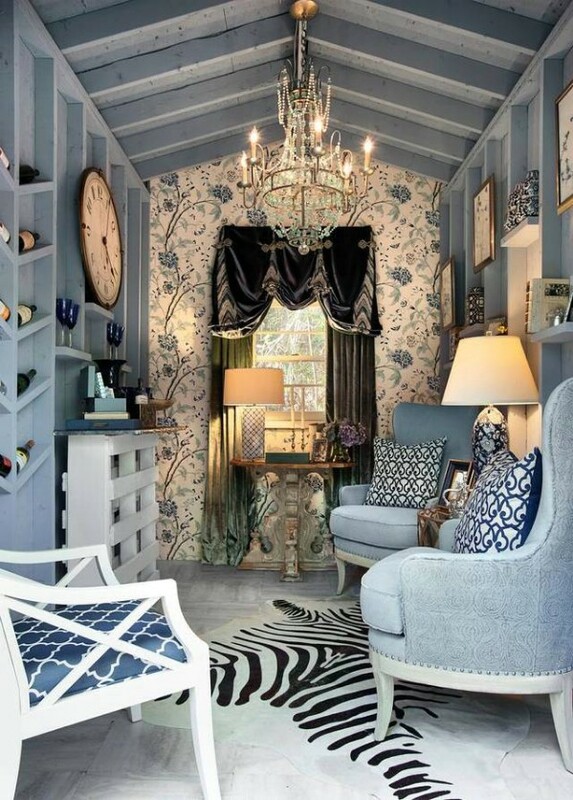 The interior of this she shed is immaculate! Every square inch has been carefully planned, with some of the most exquisite décor imaginable. Most peoples’ living rooms aren’t half as beautiful as this tiny little refuge! There are no words for the majestic glory that radiates from this she shed, which may be one of the most artistic and unique structures ever put in anyone’s backyard. All of it was designed and constructed by hand by the owner’s husband. Talk about a labor of love! Constructed of wood and submitted to a design contest, “The Hive” is a whimsical backyard bar in an inviting shed. One of the most famous and remarkable she sheds in existence is this one, constructed by Ann Bate as a tribute to her late parents, who loved everything to do with the 50s. No retro detail has been overlooked, and no corners have been cut—there is even a working jukebox inside. 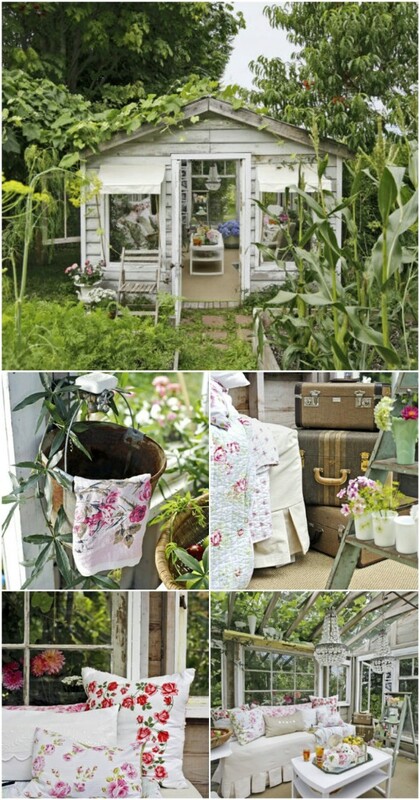 You now have plenty of inspiration to draw from if you are going to be creating your own backyard sanctuary. Whether you have an old shed you want to convert or you will be building something from the foundations up, you can construct and decorate a little backyard haven which is uniquely your own! I got a lot of great ideas! I want to turn a small 3 car garage into a she shed- He shed !